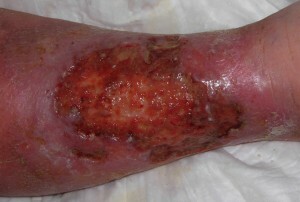 Venous ulcers (stasis ulcers, varicose ulcers, or ulcus cruris) are wounds that are thought to occur due to improper functioning of venous valves, usually of the legs. They are the major cause of chronic wounds, occurring in 70% to 90% of chronic wound cases. 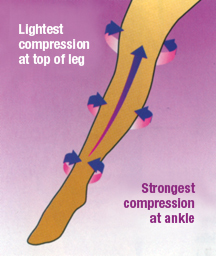 Venous ulcers develop mostly along the medial distal leg, and can be very painful. Produce local changes in microvascular haemodynamics. Minimal effect on the deep vein dynamics. Do not cure hypertension but protect skin from the effects. Occlusive arterial disease is a relative contraindication. 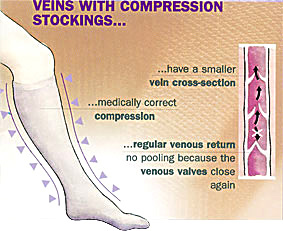 Combination of venous surgery and compression is helpful. 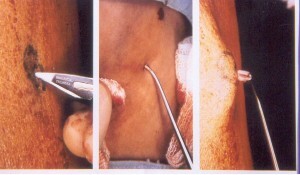 Superficial vein stripping + high ligation. Rarely Marjolin’s ulcer may develop.